This year, my friend Kristen Bonstein offered to make me a birthday cake. Here are the amazing results, with instructions so you can make a cake of your very own. Happy birthday, every one! I asked Liz what flavor cake she wanted for her birthday bash and she immediately responded "anything with salted caramel!" When I asked whether that should involve white or chocolate cake, without hesitation she replied "chocolate!" So, I knew if I ran with those two ingredients, we would have a Very Happy Liz on our hands. First, following the box mix directions, use 2 half-sheet pans to bake 2 thin cake layers at the same time. Meanwhile, with an electric mixer, beat the butter until creamy with no lumps. Add 1/4 jar of caramel sauce. Add 1 cup confectioner's sugar. Repeat the process, tasting in-between additions, until you reach the desired consistency and sweetness level (you may use the whole jar of sauce and the whole bag of sugar; that's fine), then set aside. Remove the cakes from the oven and allow to cool. Once cakes are cool, if cakes are slightly domed, use a serrated knife to slice thinly across the top until cakes are flat. Pour the remaining jar of caramel sauce over one of the cakes, then turn the other pan upside down on top of the first (caramel-y) cake. If layers or corners are uneven, use the serrated knife to trim edges. Use a silicone spatula to heap large hunks of frosting onto the cake before spreading it with a small, flat knife, pressing down gently rather than side to side. If you don't do it this way, you will have chocolate cake crumbs everywhere! Once frosting is evenly spread, use chocolate-covered pretzels to decorate as you like! For this particular cake, "LIZ!" 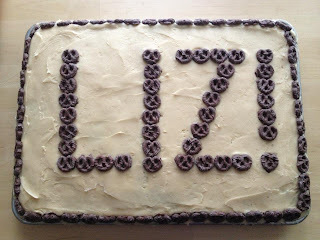 seemed like the obvious word choice, plus I had extra pretzels to line the edges of the cake. If not serving cake immediately, refrigerate so frosting stays firm. Craving more chocolate? Check out Molly's Chocolate Peanut Butter Cake or Liz Laneri's Raw Chocolate Pudding.